as the title suggests, here I am, back from camp. we had a great week, and I think the teenagers did too. 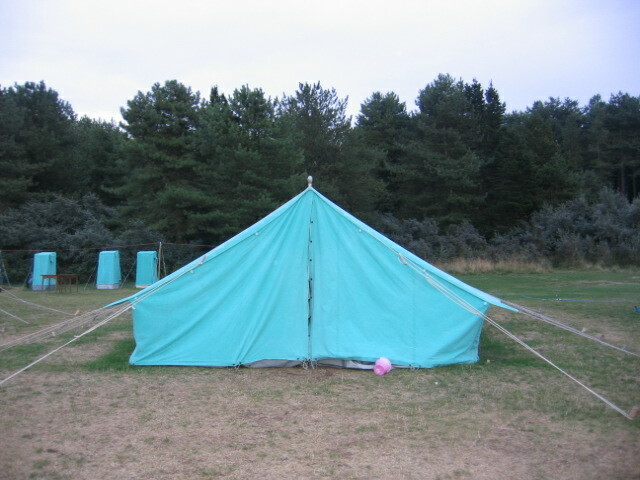 The pic is of our tent, taken at dusk on the last night when I suddenly thought hmm should take a pic!! look at the lurvely toilet tents in the background. It is a small christian camp, with about 40 people in all - not all in our one tent though, it would be awfully squashed, of course there are many more tents just out of shot. me and Andrew are joint leaders along with a couple of other people, although I really dont do much except look after my children and run the couple of craft workshops, and just be around. Andrew does more, so I try not to feel too guilty about my time in the park or on the beach or just hanging about. actually, I did spend a whole afternoon this year sitting outside a visitors centre on a small mound of grass covered in rabbit poo with 3 children under 5 ( I really hope youngest didnt eat any of that poo), no money (had thought I had my purse, but had taken it out of my bag earlier in the day), opposite an ice cream van (torture), no phone and nothing to do except wait around for groups of teens to briefly visit as part of a living cluedo game. so, fair dues, I suffered my part! the craft workshops went well, shrinky dink was touch and go for a while when I discovered the camp oven had for temperature control a handwritten 'high' and 'low' at either side of the control knob, and the first batch to go in screwed up into tiny scrumpled balls eekk. too hot or too cool??? I chanced it that it was too cool, beefed up the heat, left the scrumpled shrinks in, and eventually they flattened out and all the next lot worked fine. phew, catastrophe averted. I did forget to take pliers though, so my teeth and nails had to attach and open/close all those jump rings ouch!! amazingly I didnt chip my teeth, though my nails got torn a few times. The other craft we did was mirrors. using a bathroom tile as a base, with a layer of grout on top, a mirror tile in the middle, and various shells, pebbles, marbles and beads to decorate. simple as and seemed to go down pretty well too. some people made more shrinky dinks as well. so, now we are home and washing every clothing item in sight, a permanent line full of washing, and later in the week we are off again on another jaunt. What a great post - looks like you had lots of fun :) The rabbit poo made me laugh! oh and the forgetting the pliers... That will teach you for being up at 3am! I've loved your last few posts as they have reminded me of the days we were leaders on youth camps! Is the camp run by an organisation or just a local youth group thing? Glad your back.... no money opposite ice cream van with small children.... oh dear... bet you were popular !!! !